Eugenia Willingham shows photographs of her lost grandchildren and the stepson who was executed. Ardmore, Oklahoma (CNN) -- Cameron Todd Willingham's family here in Oklahoma never believed he set the fire that killed his three daughters. "We could not even imagine it," his cousin, Patricia Cox, recounted recently. "That was completely ludicrous to us." But 16 days after the fire, Willingham was arrested. And within a year, he was on death row. On February 17, 2004, he was strapped to a gurney in a Texas prison and given a lethal injection, proclaiming his innocence to the end. The story of how Willingham -- Todd, to his family -- went from a home on a shady street in Ardmore to the death chamber is a tale of science and skull tattoos, of last-minute hopes raised and dashed. It is a story wrapped up in allegations that the governor who let the execution go forward is now trying to derail an investigation into whether Texas put an innocent man to death. And in Ardmore, where Willingham's baby shoes still sit on a desk in the house where he grew up, the family that fought to save his life is still trying to clear his name. "It's not over," Cox's sister, Judy Cavnar, said. "This is a long way from being over." The fire started about 10 a.m. on December 23, 1991. Willingham, then 23, was asleep in the wood-frame home in Corsiana, Texas, that he shared with his wife and children. Stacy had gone out to buy presents for 2-year-old Amber Kuykendall and the 1-year-old twins, Karmon and Kameron Willingham. Times were tough for the couple. Todd, who'd worked as a mechanic, at an auto-parts store and for a glass company, was unemployed and the couple was behind on bills. Willingham told investigators that Amber woke him up when the fire broke out, and he told her to get out of the house. He said he then crawled on the floor into the children's room to find the twins, but failed. Christmas was spent making funeral arrangements. Stacy's family blamed Todd for the children's deaths "because he couldn't get them out," said his stepmother, Eugenia Willingham. "There was so much friction in the air." People in Corsicana took up a collection to help the family. Donations helped pay for gravestones and a plot in an old cemetery downtown. But to police, the grieving father was starting to look like a murderer. He told different stories about how he escaped the fire. He said he thought Amber was in the children's room, which had a baby gate at the door, but her body was found on his and Stacy's bed. His injuries didn't match what he told investigators about his efforts to rescue the girls. Witnesses at the scene said Willingham wouldn't go back into the house once he escaped, but took care to move his car away from the burning home. "The actions he took were not the actions of someone with a kid burning up and him right outside," said Sgt. Jimmie Hensley, the lead investigator for Corsicana police. The actions he took were not the actions of someone with a kid burning up and him right outside. Despite Willingham's complaints about a faulty microwave and squirrels in the attic, firefighters found no sign of electrical issues that might have caused the fire. A space heater in the children's bedroom was off, and the gas line that fed it had no signs of a leak. But they did find burn patterns on the walls and floor that were considered signs some sort of flammable liquid was used to start the blaze, as well as patterns of cracked glass that were considered a sign of arson. Meanwhile, detectives began to hear about Todd's fights with Stacy, including claims he once beat her in order to cause a miscarriage. Police said he told his mother-in-law that he believed he would be blamed for the deaths because of "unusual marks" on Amber's neck. Willingham was arrested January 8, 1992, the day before his 24th birthday. He told his stepmother, "I don't have a chance down here." Todd was an outsider in Corsicana, a town about 60 miles south of Dallas. Stacy's family had deep roots there, and he'd moved there to be with her after a stretch in an Oklahoma boot camp for a probation violation. As a teenager, Todd had started huffing paint and dropped out of school. He'd been on probation for burglary, theft and driving under the influence and did a few days in a county jail for carrying a concealed weapon. "He was certainly defiant and rebellious, as teenagers sometimes are in high school," Cox said. But his probation officer "took a special interest in him. I think she saw in him, too, that he was a child of inopportunity." Todd's father, Gene, ran an auto salvage yard in Ardmore, an oil patch town with a sharp line between rich and poor. He took custody of the 13-month-old boy after his ex-wife abandoned him as an infant, and he and Eugenia raised him. Eugenia Willingham acknowledges that Todd and Stacy had a "stormy" relationship, and that Todd told differing stories in the days after the fire. But she added, "I don't think he really knew what he did. I'm sure he was in shock." And before his execution, he admitted he hadn't gone back inside after his first attempt to find the children. "He just didn't want people to think he didn't try," she said. "Of course, they thought that anyway." He just didn't want people to think he didn't try. Of course, they thought that anyway. Willingham's August 1992 trial lasted three days. Prosecutors had offered him a chance to plead guilty in exchange for a life sentence, but he refused. The Willingham family raised money for his attorneys and for a new suit for the trial, only to hear prosecutors mock Todd as "a baby-killer dressed up like a lawyer," Eugenia said. Witnesses called him a "sociopath" incapable of rehabilitation and suggested the tattoo of a skull on his left shoulder, combined with his fondness for heavy-metal bands like Iron Maiden, indicated a bent toward Satanism -- a claim that still rubs the family raw. The jury took less than an hour to find him guilty of capital murder. Eleven and a half years later, his appeals exhausted and pleas for clemency denied, he was headed for the death chamber. His relatives last saw him less than an hour before the execution. "He told us he had 55 minutes until he'd be a free man," Cavnar said. But when a prison doctor came to check on him, Todd told him, "I'm not going to die on you. You're going to have to kill me." After the execution, a prison chaplain told the family, "Todd went, but he didn't go quietly." Stacy was the only one of his relatives to view his death. Though she stood by him during the trial, forcing prosecutors to question her as a hostile witness, she filed for divorce soon after he went to death row. Eventually, Willingham's family said, she came to believe he was guilty -- and as his execution drew near, she refused to allow him to be buried alongside the children. Witnesses said Todd died cursing her, saying he hoped she would "rot in hell." "I am an innocent man," he declared, "convicted of a crime I did not commit. I have been persecuted for 12 years for something I did not do." His body was cremated. 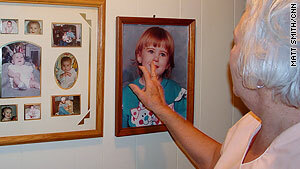 Despite Stacy's wishes, his family snuck into Corsicana to scatter some of his ashes on the girls' graves. I am an innocent man, convicted of a crime I did not commit. "We weren't in the cemetery 10 minutes before everyone knew it," Eugenia Willingham said. Efforts to reach Willingham's ex-wife for this story were unsuccessful. But in a statement issued to the Fort Worth Star-Telegram in October, she said Willingham confessed to killing the girls during a visit about two weeks before his execution. "He said if I didn't have my girls I couldn't leave him and that I could never have Amber or the twins with anyone else but him," her statement reads. "He told me he was sorry and that he hoped that I could forgive him one day." She had never reported that confession before, and told the Corsicana Daily Sun in 2004 that her ex-husband was sticking to his account of the fire. And Willingham's family disputes the account, his stepmother said. Cox said the Willinghams have tried to be sensitive to Stacy's family -- but "there's a loss up here not of three lives, but four." In the years between Willingham's trial and execution, Cox tried to get television crime shows interested in her cousin's case. One show, in 2002, featured Gerald Hurst, a chemist and explosives expert in Austin, Texas. There's a loss up here not of three lives, but four. "All I had was a town," she said. "So I got on the Internet and I sent six letters out to attorneys who handled arson cases." One of those lawyers responded with a phone number for Hurst, but Cox said no one answered when she called -- "Not even voice mail." But Todd still had appeals, and it "wasn't critical," she added. After several more unsuccessful efforts, she moved on. By late 2003, it was critical. The U.S. Supreme Court refused the last of his appeals. His execution date was set for February 2004. Cox had started lobbying the governor's office for a reprieve, and she decided to make one "last desperate attempt" to reach Hurst in early January 2004. "I just simply picked up the phone again, and he actually answered. I couldn't believe it. I think I was speechless." With just weeks remaining before the execution, Hurst agreed to look into the case. He concluded that the indicators investigators pointed to as evidence of arson had been rendered obsolete since 1991, and "would be considered invalid in light of current knowledge." The family was elated by the report. But, Cox said, "It got better before it got worse." Hurst's report went to the state Court of Criminal Appeals. In a two-page order the day of Willingham's execution, it ruled the report "does not meet the requirements for consideration" as new evidence of innocence. It also went to the state Board of Pardons and Paroles, which denied a request for clemency, and to Gov. Rick Perry, who could grant only a 30-day stay of execution without the parole board's authorization. None moved to stop Todd's execution. "We just ran out of time," Cox said. "Todd ran out of time. We all ran out of time." But since 2004, two more reports have backed up Hurst's findings. The first was delivered in 2006 by the Innocence Project, which seeks to clear prison inmates it believes were wrongly convicted. That led the Texas Forensic Science Commission to mount its own investigation. The commission hired Craig Beyler, chairman of the International Association for Fire Safety Science, to review the evidence against Willingham. And Beyler's report, filed in August, determined that the finding of arson in the Willingham fire "could not be sustained." The investigators who testified the fire was deliberately set "had poor understandings of fire science and failed to acknowledge or apply the contemporaneous understanding of the limitations of fire indicators," it states. In a 21-page rebuttal, the Corsicana Fire Department says it stands by its original conclusions. Hensley dismissed the reviews as "Monday-morning quarterbacking" by experts unfamiliar with all the evidence. "I'm firmly a believer that justice was served," Hensley said. But opponents of capital punishment say the Beyler report has brought Texas eyeball-to-eyeball with the uncomfortable prospect of admitting it had put an innocent man to death. And they say Perry -- a Republican facing a tough primary challenge in March -- blinked. Two days before the Forensic Science Commission was to question Beyler in a public forum, the governor replaced its chairman and two other members whose terms were up. That forced the commission to delay the hearing so new members could read up on the case, and no new date has been set. Perry has since replaced a third member of the commission. I'm firmly a believer that justice was served. The governor defended the replacements as routine, and says he remains confident of Willingham's guilt. He told reporters in October that Willingham was a "monster" whose conviction was upheld repeatedly by the courts. But the shakeup has become an issue in his re-election campaign, and a state Senate committee has a hearing scheduled Tuesday to question the Forensic Science Commission's new chairman about his plans for the case. "I want a status report," state Sen. John Whitmire, D-Houston, the chairman of the Senate Criminal Justice Committee. "He's been there a month." Back in Ardmore, the Willingham family has learned some hard lessons. One is that there's a legal system in America -- "not necessarily a justice system," Cavnar said. Now that the Texas investigation is in limbo, Cox said she's choosing her words carefully. The investigation "meant everything to us," she said. "We're a little fearful that it's not going to happen." But she said they're still determined to press the issue -- not just for Todd, but for others on death row who might be in the same circumstance. Said Cox: "If you don't think it can happen to you, you're wrong."